It had been a long day for me. No…really. And, while a part of me was super stoked that I was leaving right from work to drive up to Cincinnati, Ohio, with my roommate, for a concert, another part of me just wanted to curl up under a blanket on the sofa at home. But…there was music to be enjoyed. And she had purchased a set of tickets to see Bastille in Cincinnati awhile back to help cheer me up. This foot injury has had me pretty down since July…and she thought a surprise and a band I love might just help lift my spirits. It did. but this was a crazy, intense week at work, and my brain was ready to shut down. Thankfully, that mindset changes when you actually get on the road to an event that you are really looking forward to. So, at 4 p.m., we departed the office and hit the road up to Cincinnati, Ohio. A couple of days prior, Cathy had made reservations with a place not to far from US Bank Arena (the venue for the show) due to some gluten-free options available on their menu. I love trying out new food places so…WOOHOO! Even better…it had fish and chips readily available for her. YAY! She made the reservations for 6:30 p.m., which would give us some time to hit traffic and get into the city, park, and get to the venue. The last-ditch food option would be Chipotle, if the traffic gods were not with us. But they were…and we arrived in Cincinnati just before 6 p.m., having only hit some traffic in Covington, Kentucky, just before crossing into Ohio and hitting Cincinnati. We readily found parking and got out, making the short stroll from the parking garage (with it’s $20 event parking!) to the restaurant, which was literally one block up and then over…down toward the river walk. Beautiful night too. Perfect weather. We walked up the stairs to Moerlein Lager House and stepped inside. There were a few people ahead of us, but most went right to the bar. We stepped up and Cathy mentioned that we were early, because traffic wasn’t as bad as we anticipated…and they were more than happy to sit us down early. Nice. We were shown to a very nice table, somewhere between the rowdy bar and the floor to ceiling windows, which offered a spectacular view of the riverfront. We were given our menus and a menu that had the specials on it, where if any item were ordered off that menu, a donation would go towards a charity. Tempting, but there really wasn’t anything on there for me…and Cathy had her heart set on fish and chips. Our waitress, Kelly, came over to see if we wanted something to drink. We started with water. And when she returned, she asked if we wanted any appetizers or had any questions on the menu. Cathy mentioned that I was a gluten-free vegetarian…and she came over. I think she missed the “vegetarian” part following gluten-free…because she highly recommended the crab cakes. But…hey…she tried. And…working in it’s favor – the restaurant labeled everything V for vegetarian and GF for gluten-free. And wouldn’t you know it…they had a dish that fit both requirements. Cathy ordered her Fish and Chips ($18.00), which was cod that was battered with their house beer, Hudelphol, and served with a jalapeno tartar sauce, coleslaw, and fries…and decided she’d live dangerously with a non-alcoholic beer (I agree with some friends of mine on this…what’s the point??! ), Einbecker ($7.00) to have with her entree. 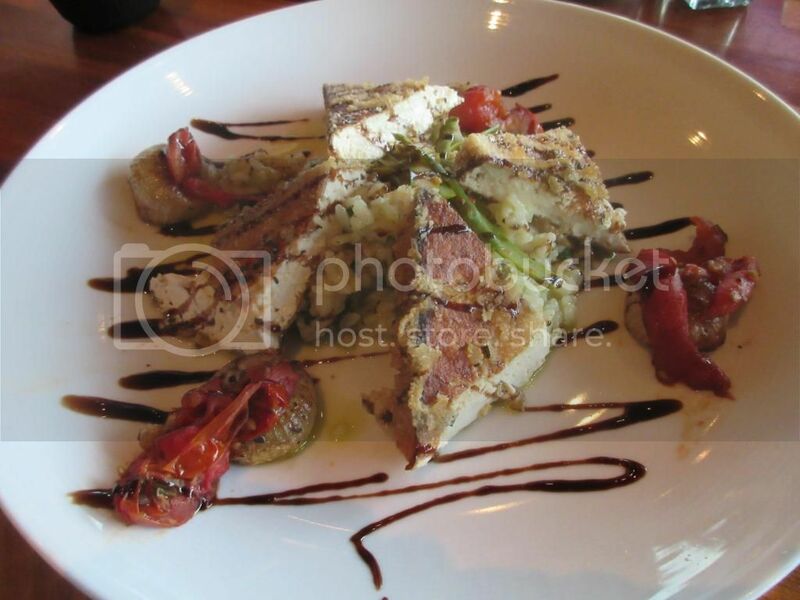 As for me…I happily placed an order for the Crispy Balsamic Tofu ($17.00). YES! You read that right. This entree was served with a spinach basil risotto and roasted tomatoes, cipoline onions, and wild mushrooms, topped with shaved asparagus and preserved lemon salad. It had actually been a toss-up between that entree, or ordering a few sides and dining on that. Cathy pointed out I could get those sides offered virtually anywhere…but the tofu dish was an original. I agreed…and that’s what I ordered. While we waited for food, we discussed the concert…the music…my upcoming marathon…my foot (which to this day still bothers me! )…and the restaurant itself. And, when our food arrived, we were both certainly ready to dive in and devour. My dish looked beautiful. It was a true culinary work of art. The tofu was sliced on the diagonal, making perfect triangles that had this great crispy coating on the outside. It was all set over this mound of perfectly creamy risotto with the vegetables framing the outside of the dish. Shaves asparagus topped it all off and there was this gorgeous balsamic reduction that was drizzled over the plate. I felt bad slicing into it…but I was hungry, so that moment only lasted briefly. One bite was all I needed to realize how much I loved this meal. The tofu had this great crispy outside, but inside it was still rich and soft. It was glazed perfectly with the balsamic reduction and the hit of lemon just made it shine. The shaved asparagus was cooked to a perfect al dente and used as not only a garnish, but as a great addition to the roasted vegetables on the plate. The onions were spectacular and the tomatoes were soft and juicy. But the star…the absolute star of this entree was the spinach basil risotto. It was phenomenal. Creamy and rich and packed with great earthy and herby flavors. I was already telling Cathy after one bite that I wanted to recreate this dish at home. She sampled the risotto and understood why. I also had her try the tofu…and she really liked that as well. This dish hit on everything I liked. It had a nice tang to it, but the flavors were simple and real. And I ate the entire thing…possibly in record time. 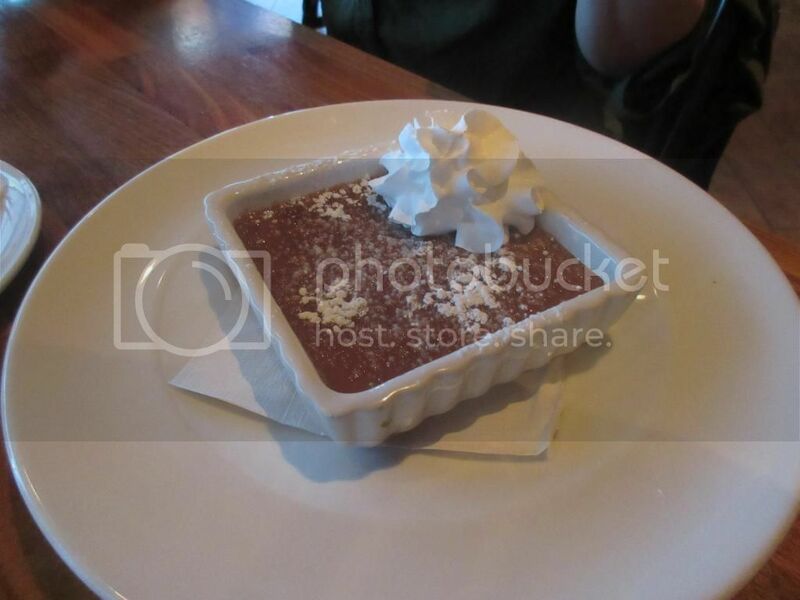 A dessert menu was brought to our table and after a bit of discussion…and the mention of a Chocolate Creme Brulee ($7.00), Cathy and I decided that we could treat ourselves and split the dessert. Cathy checked with Kelly to make sure the Creme Brulee was gluten-free. She said she thought it was, but would check. It was…and after a small wait, the delicious looking dessert was arriving at our table with two spoons. Holy Moses! This was one spectacular and rich dessert. The burnt sugar on top was fun to crack through, but what it gave way to was this rich and decadent chocolate cream. Cathy described it as high-class pudding. HA! And that’s what it tasted like. It was amazing. And I think once we set the spoons down, Cathy might have licked the bowl a little bit. Honestly, the service was amazing and I didn’t feel nervous about eating here. The clearly labeled items on the menu helped make it very easy to navigate and to make sure I got what I needed and wanted. And what would be safe for me. Cathy loved her meal, and even enjoyed the jalapeno tartar sauce. She said it was her second favorite tartar sauce she’s had yet. That’s something. The food was outstanding. I mean…it’s not every day I can get a vegetarian dish that is also gluten-free at a restaurant without it being…a salad. So, this was a nice treat, indeed. And one day, when I run the Flying Pig Marathon…you better believe this is the place I’ll be hitting up for dinner. 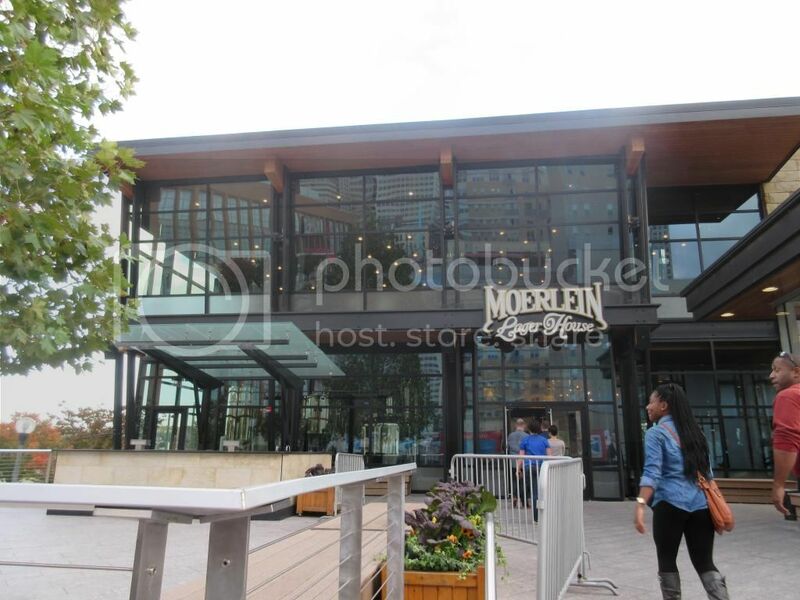 Thank you, Moerlein Lager House…you exceeded my expectations! This entry was posted in Chocolate, Dessert, Drinks, Entree, Event, Food, Gluten-Free, Mushrooms, Pub, Restaurants, Review, Rice, Salad, Sweet Stuff, Tofu, Travel, Vegetables, Vegetarian by The Celiathlete. Bookmark the permalink.